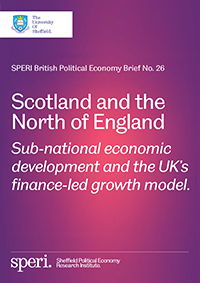 A new SPERI British Political Economy Brief ‘Scotland and the North of England’, published today, compares economic development in Scotland and the North of England since the creation of the Scottish parliament in 1999. Authored by Scott Lavery, the Brief focuses on two major sectors – finance and manufacturing – and shows that despite enjoying distinct ‘devolved’ policymaking competences, Scotland’s economic trajectory since devolution has closely mirrored that of the North of England. In terms of manufacturing output and employment, both Scotland and the North of England have experienced similar patterns of decline since 1999. In financial services, both Scotland and the North of England have failed to maintain their share of financial services markets relative to the UK average and in relation to London in particular. This trend has intensified since the 2008 crisis. The author argues that despite differences in regional economic governance institutions, Scotland and the North of England share important structural features. Both regions therefore face similar economic challenges in the years ahead. These give rise to a number of questions for policymakers in Scotland, the North of England and Westminster respectively. Download SPERI British Political Economy Brief No. 26: Scotland and the North of England: Sub-national economic development and the UK’s finance-led growth model. When the Scottish parliament was reconvened in 1999, it was widely argued that this would lead to a ‘devolution dividend’ whereby the parliament’s new devolved powers would allow Scottish policy makers to boost economic performance. However, the evidence suggests that devolution has not brought about a significant shift in Scotland’s economic fundamentals. Manufacturing has slumped from 17 per cent of Scotland’s economic output in 1999 to 11 per cent according to the latest figures. This has been paralleled by a significant decline in manufacturing employment, which has fallen from 322,000 in 1999 to 198,000 today. These shifts mirror similar declines across the North of England, suggesting that Scotland’s devolved powers have not allowed Scottish policymakers to escape broader structural changes in the UK economy. What is more, Scotland has not experienced a boom in its financial sector in relation to the rest of the UK and in particular in comparison to London. In 1999, Scotland’s financial sector output amounted to 81 per cent of the UK average. While by 2006 this figure had increased to 90 per cent, since the 2008 crash, Scotland has seen its financial sector output fall to 79 per cent the UK average. Scotland has therefore failed to maintain its share of UK financial services, particularly over recent years. This has important implications for financial sector employment. Of the regions we studied, only London has seen its financial sector employment increase since 2009, by 10 per cent. In contrast, Scotland has seen financial sector employment fall from 94,000 to 85,000 – a decline of 10 per cent.